DVD REVIEWS: Coraline 2-Disc Collector’s Edition – Henry Selick’s Brilliant Film Gets A Cool DVD Release! Coraline is the little 3-D film that could. Although it wasn’t any kind of a tentpole event, it quietly made almost $115 million in its theatrical run. Not bad for a 3-D stop-action animation film. The story, about a little girl who discovers an alternate world where her Other Parents dote on her – as opposed to her real parents, who don’t seem to care – is one of author Neil Gaiman’s most loved stories. Although it underwent several changes in its journey to film, Gaiman heartily approved of the film version which really does capture the feel of the book beautifully. It takes a lot of work, and a lot of artistry to make a stop-motion animated film – a a good deal more to make a brilliant one. The features or this excellent edition really explore what it takes to make a film as good as Coraline. The features begin with a thorough commentary by writer/director Selick that includes a brief explanation, by composer Bruno Coulais, of how and why he composed the score. Disc Two contains a lot of cool behind-the-scenes material: several Deleted Scenes – with introductions of each by Selick, who explains why they weren’t used; The Making of Coraline [The Evolution of the Story; Inspiring Design: Character Design and Art direction; Directing the Voice Sessions; Making Puppets; Coraline’s Closet; Setting the Stage: How Does Your Fantastic Garden Grow? 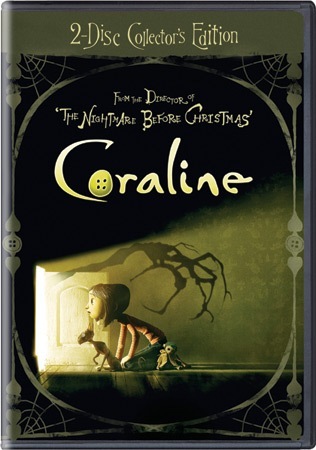 ; I’ve Seen Fire and I’ve Seen Fog; It’s Alive; The Eyes Have It, and Wrapping Up Coraline]; Voicing the Characters, and a Digital Copy of Coraline.